This past Friday I woke up with a bad cold. So, instead of working and then going out for a night on the town (read: a trip to the bookstore), I was laid up in bed all day sick. I was feeling poorly all evening, so I curled up on the couch with a cup of herbal tea and decided to fire up the Nintendo 3DS. Most of my gaming is on my Xbox One, but occasionally I’ll be in the mood for some handheld gaming. Friday was one of those nights. 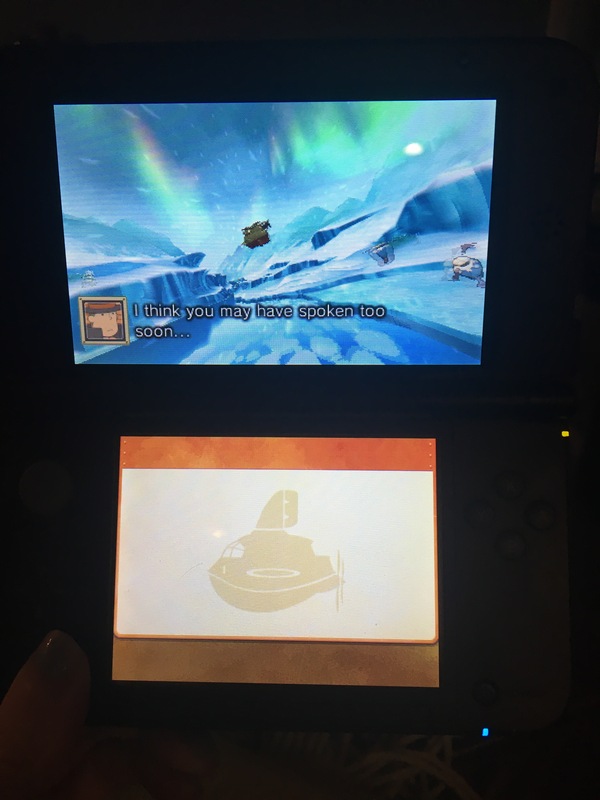 I decided to play Professor Layton and the Azran Legacy. If you’re not familiar, the Professor Layton games are a series of puzzle games from Japanese video game developer Level-5. The franchise holds a special place in my heart, as I spent many a stressed out night during graduate school playing these games to unwind. 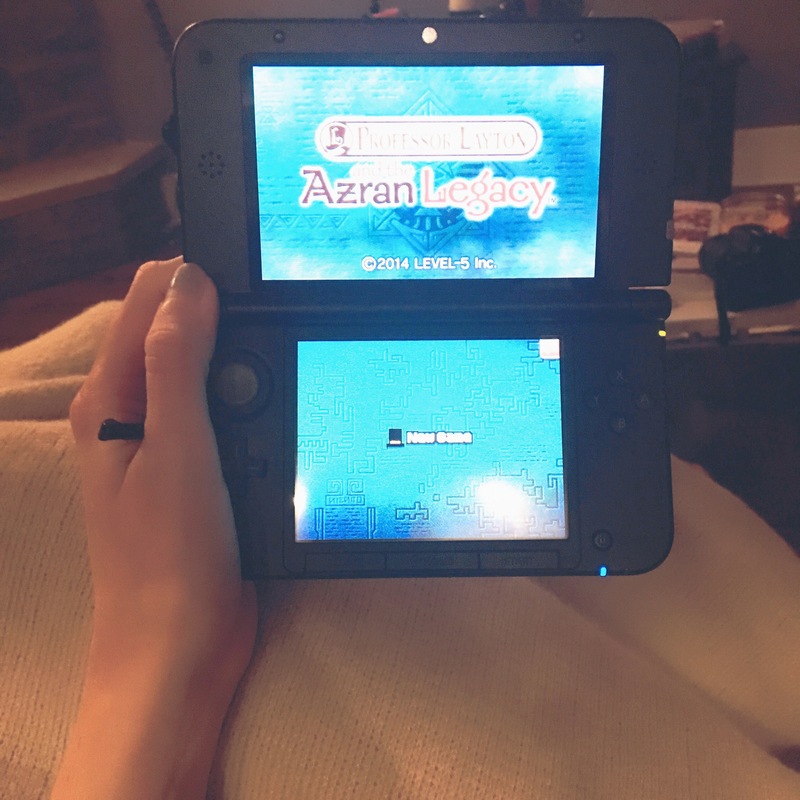 Released in North America in February 2014, Azran Legacy tells the tale of Professor Layton on the hunt to solve the mystery of an apparent living mummy, who has mysterious ties to an evil organization called Targent. Gameplay is standard for Layton games: You use the stylus to dictate which direction Layton walks, and at each location, you will encounter a cast of characters who will help progress the story by offering you puzzles to solve. The puzzles are a decent mix of geometric puzzles, word puzzles, and math puzzles. My favorite puzzles are always the ones that are variants on the classic river crossing puzzle. I was pleased when, at the end of Chapter 1, there was a bit more of an adventure game feel to the game. In the interactive cutscene shown below, you are flying in an airship with the Professor, chasing the bad guys in their own airship. You must fire missiles based on quick little puzzles that are thrown at you in rapid succession. It may have been a little too easy, but I enjoyed the diversion. There are two things that always draw me into Professor Layton games: mainly, the puzzles. But secondly, the charming characters and bizarre plots. Are they even remotely realistic? No. Are there plot holes? Eh, probably. Are the characters terribly fleshed out? No way. But still, there is something about the whimsical soundtrack and endearing characters that brings me back time and again. All in all, I give this game five stars! Have you played Professor Layton and the Azran Legacy? If so, what did you think? Nice review! I have wanted to try out Professor Layton for awhile. I have the first game but haven’t started it yet because I’m also trying out Phoenix Wright for the first time. But it’s definitely on my to-play list! Thanks, Robert Ian! I am really glad you liked it! Based on the game reviews of yours that I’ve read, I think you will like Professor Layton a lot. I do recommend playing them in the order in which they’ve been published, but if you can’t do that, don’t worry at all. A great time killer is the perfect way to describe Professor Layton games. There is no ramping up period of lengthy tutorials, and you can leave the game for ages and pick right back up where you left off. Ooh, and sudoku is addicting! I used to love that. Now, my book puzzles of choice are New York Times crossword puzzles. Weirdly, despite my affection for all things literary, I prefer numerical puzzles. Not that I don’t like crosswords too. And arrowords. Essentially the same, but invariably less “grown-up”. Those books are a lot of fun! My husband and I like to do crossword puzzles a lot. I used to do a lot of sudoku but haven’t done it in forever.